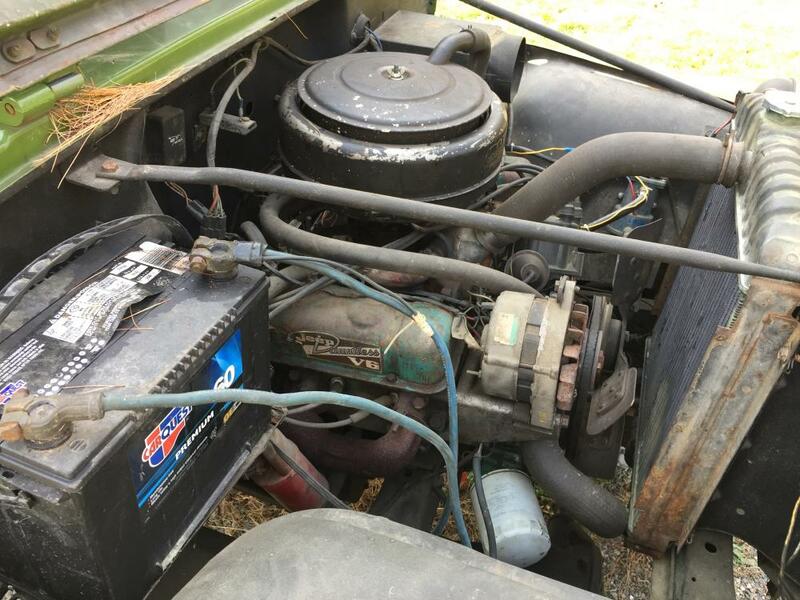 I inherited a 66cj5 and in time I'd like to restore it, let's say "High hopes!" . As far as I can tell there have been no modifications, stock replacement of parts. For now Id rather keep the engine/ ignition/ suspension stock. This may well be a play toy for the wife and I, mild but little wheeling. There are a few things that need attention. 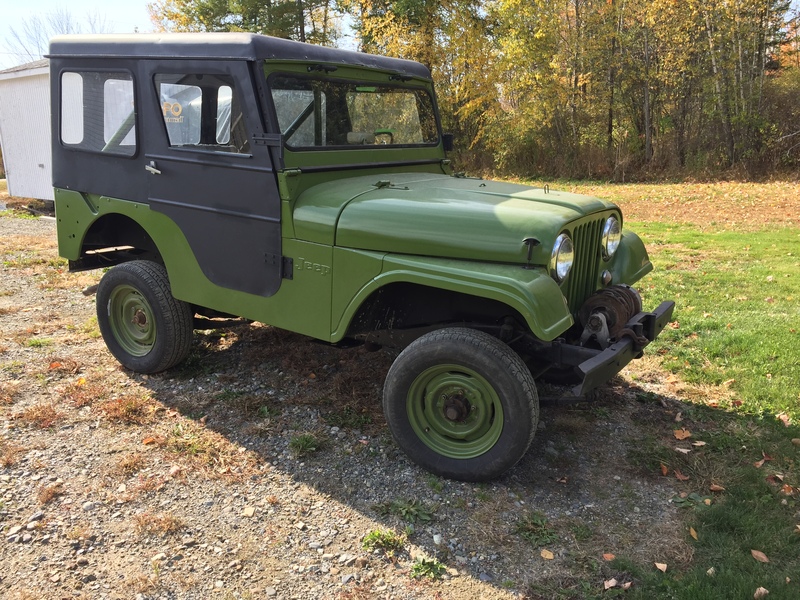 Sorry, I have nothing to offer as it relates to restoration, but I just wanted to say that is a beautiful Jeep! Thanks. The ol girl is pretty solid. Very fortunate place to start, Monty! 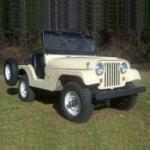 The Jeep is highly original and looks intact with the prized 225 V-6 engine. Is that a PTO winch? Wiring is a big undertaking in general. Painless Wiring and others offer "universal" wiring harnesses that are not difficult to install. I used a kit like this when wiring the 1955 CJ-5 Jeep that is featured in my Jeep CJ Rebuilder's Manual: 1946-71 (Bentley Publishers). This book, incidentally, would cover a lot of your restoration chores and provide additional insights, it's available in the book trade, at Amazon and through several 4WD parts retailers. You have a great beginning...Yes, the color change would be an enhancement! The tires you propose would be okay with the 225 V-6 engine power and the likely gear ratio. 3.73:1 is most common in CJs with the V-6; you can confirm the ratio at the axle tag. Keep us posted, your photos are great! Moses, I do have your "rebuilders" book and missed Painless Wiring. And yes it does have a Koenig pto winch. Moses' book will be a lifesaver. It does look like a solid platform from which to start a restoration. 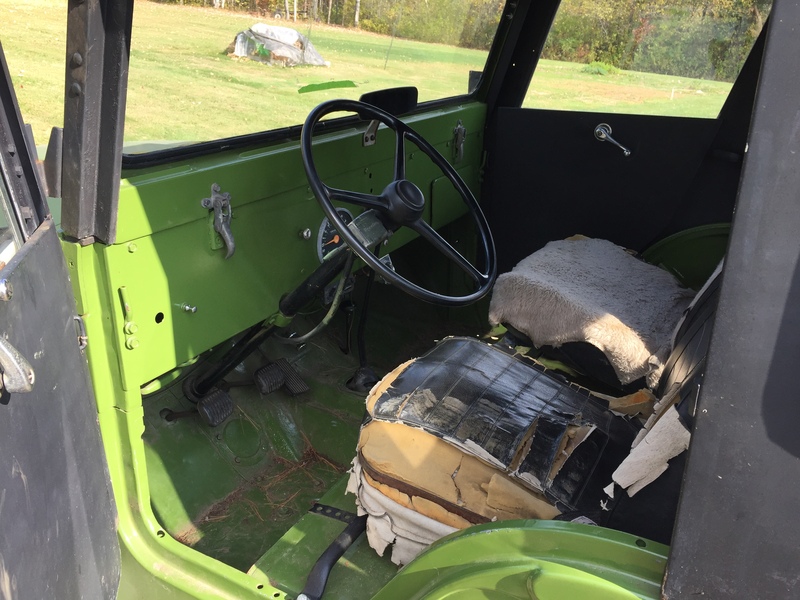 As for wiring, I did a frame up restoration of an '83 CJ-7. While everything I read about the Painless harness said they were top notch, the price was anything but Painless. I ultimately went with a Centech harness. They have many of the same features as Painless such as labeled high temperature rated wire. They also use (at least on my kit) a custom WeatherPak firewall pass through that is fully sealed. You will have to terminate some of the connections, as they leave them open so you can set the exact length of the circuit. Unlike others, MOST of the circuits like the tail lights are pre-terminated, as the routing and needed wire length is fairly static for those. Another advantage I found with Centech is their willingness to customize. My CJ has a Cherokee powertrain in it. The EFI engine requires the addition and deletion of a few wires to keep things tidy. Centech did those without additional charge. Looks like their early CJ kit retails for $389. I would at least give them a ring and see how their kit compares to Painless. Very nice jeep! 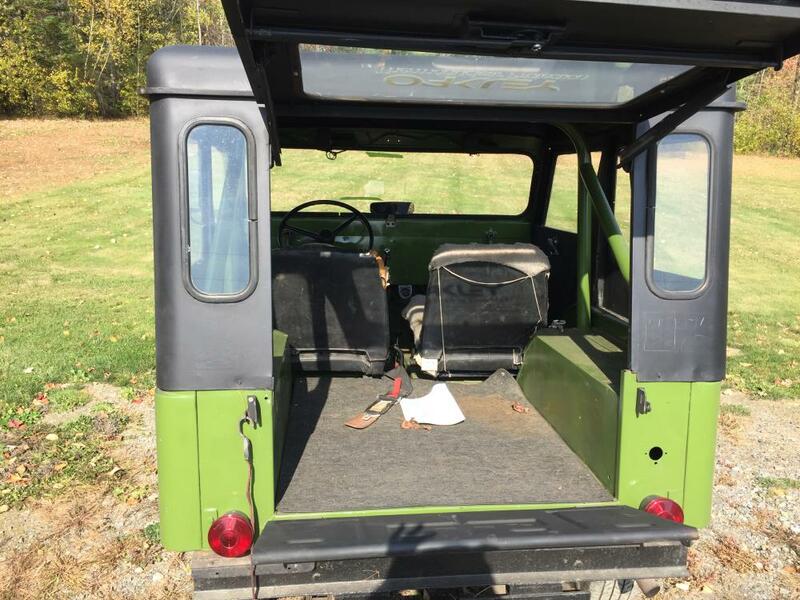 It reminds me a lot of my '67 CJ5 when I bought it 7 years ago. Walck's 4WD built the wiring harness for mine, and I can honestly say that it is superb in every way. 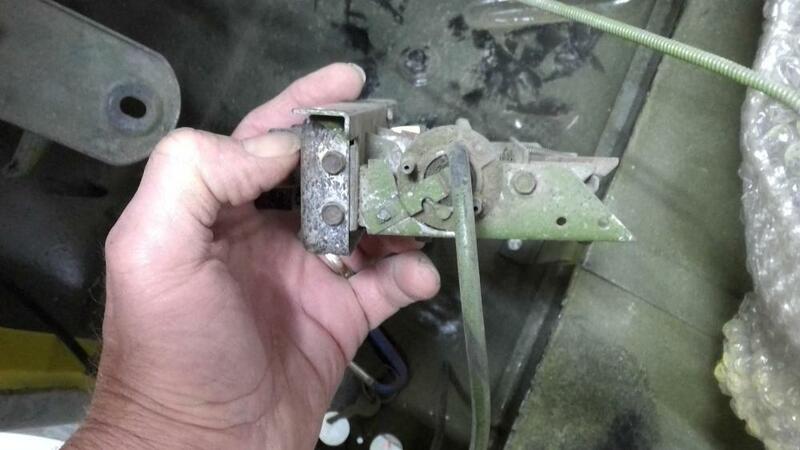 It is also probably as close to the original wiring harness in appearance as could be re-created today, though the quality of the materials exceeds the original factory specifications and electrical requirements. The ends are soldered, and the wire lengths are pre-determined, which helps to minimize the work necessary to install the harness. It not only fit well, but came with the proper connectors, bulb sockets, etc. I would highly recommend Walck's, not only for wiring harnesses, but for most any other Jeep parts you may need. Carl and his family are, as the saying goes, "Good People". I also agree 100% with 60Bubba's comment re. Moses' book....you've given an ideal gift to your new mistress! Thanks for the input and ideas! Snoopy2x thanks for the site. Where I'm not looking at staying period specific I'm leaning on 60bubba's thoughts. Centech's harness appears to be what I'm looking for. Add a few waterproof connectors and a good quality loom. I won't have to worry for ALONG time. Phone call time. 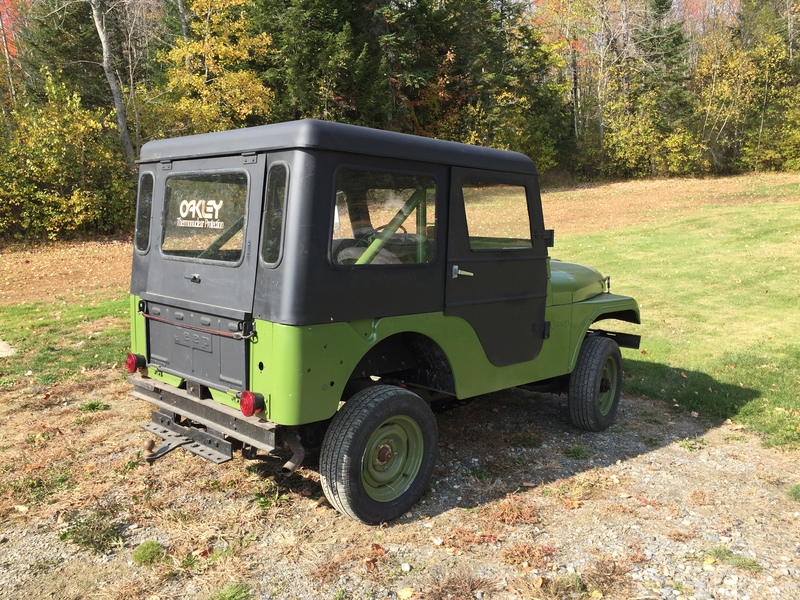 Great looking Jeep Monty. I picked up a wiring harness from Rebel Wire for my Willys build. Quality wire with labeling at a great price. While I'm waiting for harness to show up. I find I need new gaskets for oil bath breather, there is 1 inside and 1 where it sets on the carb (this one is gone). My local parts store was at a loss. Any ideas?? I want to add that wires from the wipers ended at the bottom of the widow. No signs of them ever been connected, no switch on the dash. Monty, the two red wires are the main power wires running from the switch (assuming you still have an original working switch - for photos of an original, see the link Moses included above) to each motor. The brown is the "parking" power wire, and the blue is the ground. 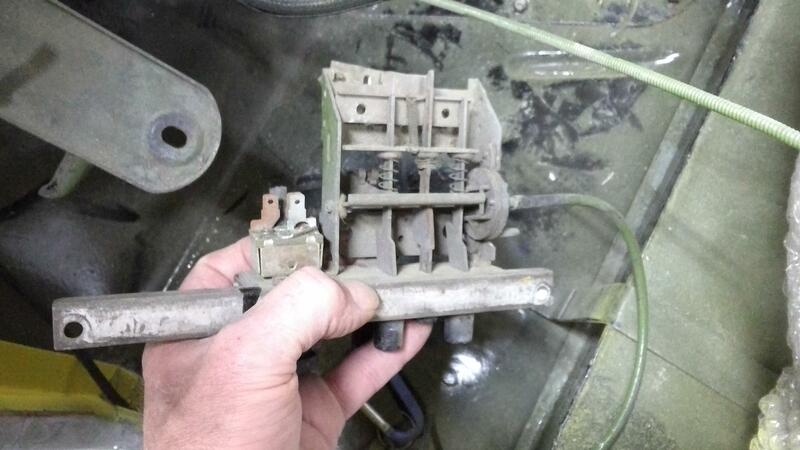 As is also mentioned in that thread, Walcks 4WD can make a repro of the wiper wiring harness, which is separate from the main harness, for you. If your switch is not original, you could have Walcks install blade connectors on the new harness, and/or bridge the two main power wires to allow you to use a different switch. The original switches are no longer available. I'll be glad to try to answer any questions about this that I can! Thanks, Maury...Monty is getting fresh, firsthand information from your recent wiper motor restoration work! 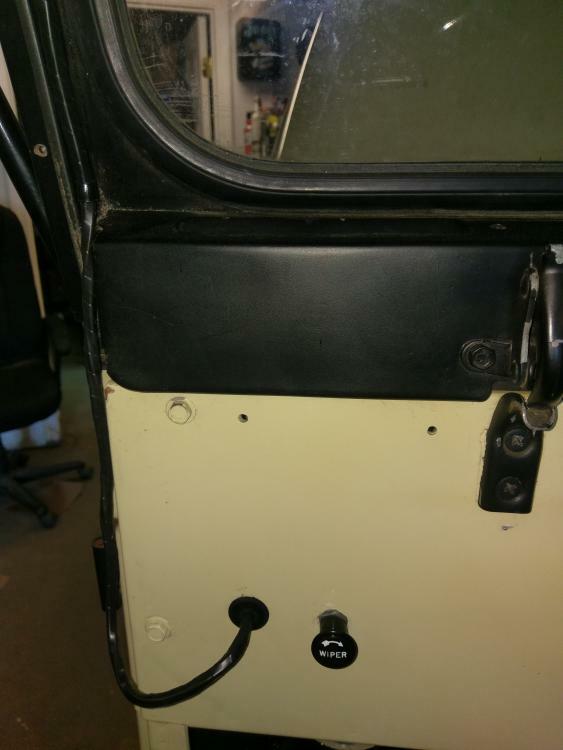 Monty, the routing of the wire as shown in this photo is the same as the original factory routing in the '66 and '67 CJ5s with the one-speed electric wipers. The noticeable slack in the wiring harness is there in order to allow the windshield to be folded down. See the note at the end of the wiper motor rebuild thread for the wiring clamps that attach the harness to the windshield frame. 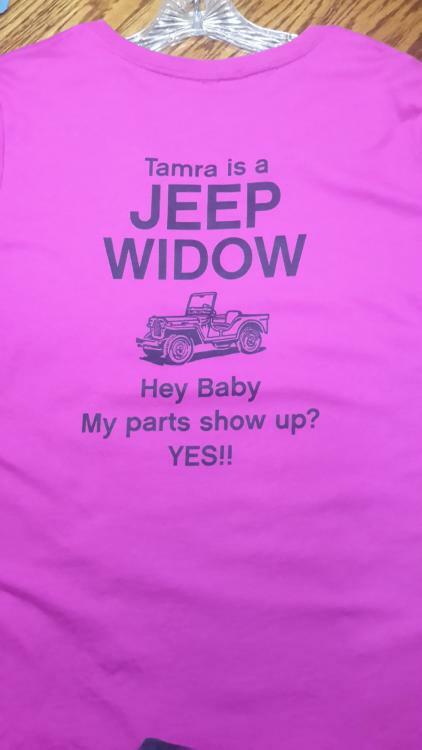 With me being gone through the week driving and spend time on the weekends working on the Jeep, my Wife and I joked that she had became a Jeep Widow. So I got her this. She just laughed and said she loved it. We've all been there, Monty! Quick question, on this new harness it has an "exciter" wire that comes off the new alternator. That would go to the Amp light on the speedo cluster? Or an Amp meter. Or I can just terminated it, correct? I can not find the paperwork that talks about that wire. Been plugging away at this harness, its a slow process when one is gone through the week. but I'm gaining. I was getting ready to wire the wipers and discovered I have a loose wire inside. Then after reading snopp2x's thread and opening the other motor I find that I'm missing the plastic piece with the brass button. Any ideas?? I had purchased a equus elec oil pressure gauge. Finally got to the point to install the sensor. And the sensor is too big in diameter. 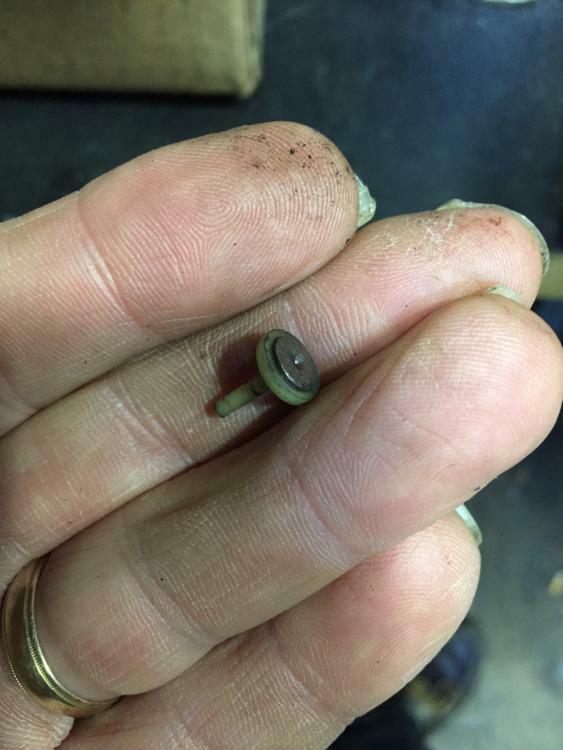 So my question is there a problem just swapping out sensors, https://www.summitracing.com/parts/smp-ps243 ? This one is much smaller diameter. Hi, Monty...Did you get past the wiper motor contact issue? Do you need snoopy2x to reply here? I followed your link, and the sender shown is for Ford applications. I looked up the Jeep V-6 sender, it also fits several Ford engines. 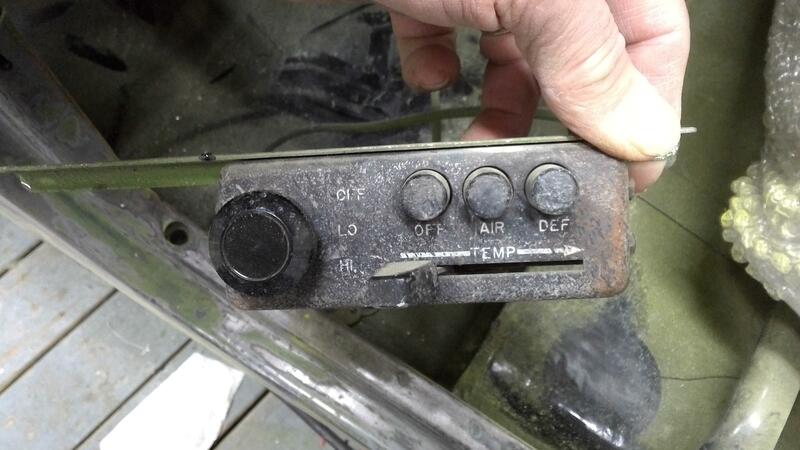 You do need a sender with the correct threads, but the sender must also match the ohms rating for the Jeep dash gauge. Look the sender up by both the Buick V-6 engine and vehicle type, you need compatibility between a sender that fits properly and also has the right ohms resistance range to make the gauge read accurately. I saw that the sender was designed to fit ford motors, I did not know about the ohms, I'll half to do some more research to find one that will fit. I ended up buying new wiper motors like you put on your jeep in your book. Monty...Those wipers worked okay...Not the same as OEM Bosch but they have proven reliable—at least here in the high desert! 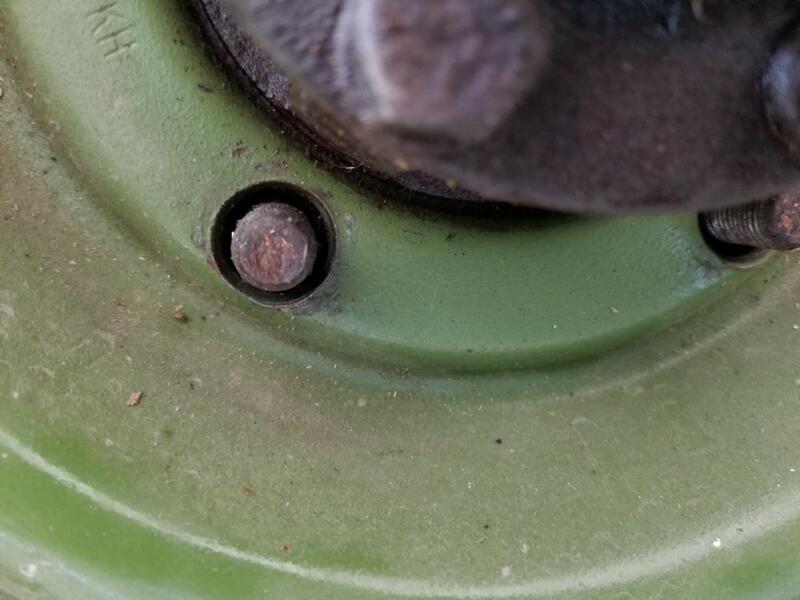 You might want to seal any areas where moisture could creep into the motors. Keep us posted on the oil sender that works...There should be an OEM replacement sender available. Try Crown or Omix-ADA. If needed, we can look up the OEM part number for the sender and cross it over to a common brand like Echlin. Let me know whether you need the OE part number for the sender. Year of the chassis is '66, and the Buick/Jeep Dauntless V-6 engine looks original. Moses, thanks for the tip on the wiper motors. As for the sending unit I cheated, I thought why not a fitting with a 45 degree angle. S o thats what I did. The fitting should work fine, Monty. 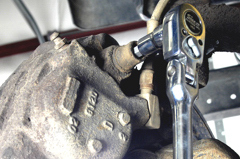 Angle fittings are common on many engines. Often the sender needs to set on an angle. If the right size and pointed in the right direction, it should work well. Hello I've been looking at wheels/tires and I need to verify my thoughts with you. Judging for the pics and the measurements shown the stud pattern would be a 5 by 5, correct? As you can see the holes are worn, enlarged. I do not have a tire shop the will test a wheel for proper fit available in my area. So I'll be taking a lot of measurement's to determine the size needed. Most likely 15/16 in by 7 with 5 by 5 bolt pattern. Leaning to the 7 in width due to clearance. Hi, Monty...These are traditional, stock CJ wheels: 5-on-5.5" bolt pattern. 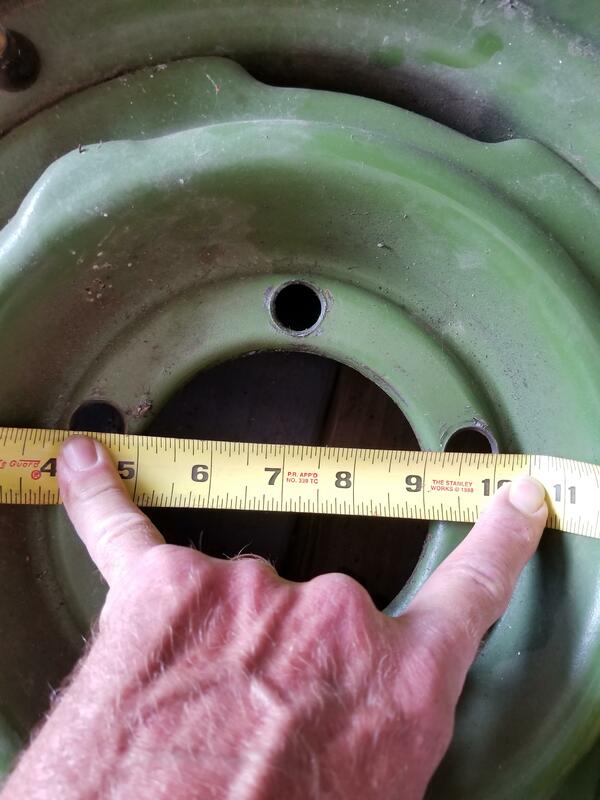 The measurement is taken as the bolt circle, not the space between two bolt hole centers. Been plugging away on my "mistress". It appears that the heater control is intact. But the vacuum does not appear to be working right. The hole at the 10 o-clock position seems to be the supply position. When I place the hose on the the hole at 10 o-clock with the DEF pushed in air blows thru the other 2 holes. With the AIR pushed in , air only comes thru the hole at 4 o-clock. With the OFF pushed in no air flows out of either of the holes. Seems to be a problem with the defrost. Is there anything that can be done? Hi, Monty! Interesting...So, you're applying vacuum to the port at 10 o'clock? It would seem that you need the option of AIR and DEF functioning at the same time. Otherwise, you would have either defrost only or heat (floorboard) only. If AIR is ambient air ducting through the heater core, that would allow heat without the blower on. Typically, the flaps open with vacuum, not with pressurized air. What you would want is to have vacuum apply to the defroster flap with the DEF pushed in. You would want air to flow from the floorboard vents with the AIR pushed in. That should help determine which port on the switch is the vacuum source. Your vacuum supply source should be vacuum from the engine (manifold), a constant source that is either OFF or directed to the AIR or DEF flaps, depending upon the position of the vacuum switch. Make sense?